BELLE FOURCHE, S.D. 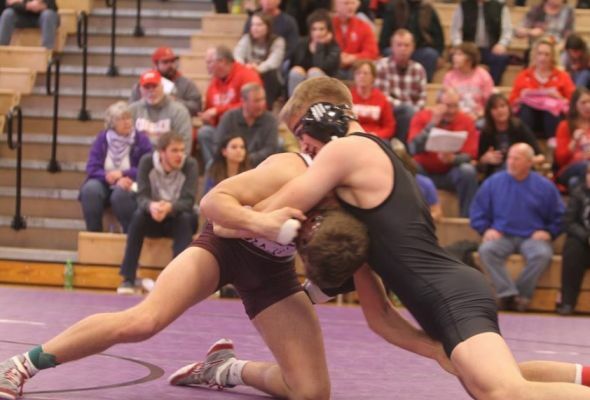 - Rapid City Stevens captured the Region 4 wrestling title in Class A Saturday. For the Scoopers, three wrestlers won titles. Jacob Wood captured the 120 pound title over Logan Fischer of Rapid City Stevens. Kaden Olsen won at 106 over Jack Schoenhard of Stevens and Logan Desersa upset Cody Stockman for the 126 pound crown. In all, the Scoopers will send 12 wrestlers on to the state tournament next week. Stevens will send 13 wrestlers to state and crowned three champions Saturday. They were Landen Fischer at 113 pounds, Cooper Voorhees at 152, and Nate Allen at 160. Rapid City Central qualified 12 wrestlers for state and crowned 6 champions Saturday. Among them, top ranked Wyatt Jungclaus at 170. Spearfish, who came in fourth in the team standings, qualified 9 for state. Meanwhile, at the Class 4B region tournament, Philip won the team title with 221 points and qualified 10 wrestlers for state. Custer/Edgemont was second and had six winners. The rest of the team standing include Lead-Deadwood in third with 120, Mobridge-Pollock in fourth with 116.5 and Hot Springs with 114.5. Philip qualified 10 wrestlers for state including titlists Jadyn Coller at 126, McCoy Peterson at 138, Hunter Peterson at 145, and Cody Donnelly at 182. Custer/Edgemont will send nine grapplers to the Rushmore Plaza Civic Center next weekend, including region champions Logan Graf at 106, Jacob Bruner at 113, Jonathan Lewis at 120, Chance Grill at 152, Levi Mines at 160), and Micaiah Grace at 172. Other Black Hills-area winners included Lead-Deadwood’s Carson Pinske at 132nand Robbie Lester at 285. Lead-Deadwood ended up qualifying six for state. Garrett Heil of Hot Springs, the 195-pound winner, will be one of five Bison state qualifiers. St. Thomas more will be represented by Tyson Durham at 113 and Corten Dobesh, the Region 4B runner-up at 182.